When Jermaine Massey, a paying guest at a DoubleTree hotel in Portland Oregon, went into the hotel lobby to call his mother — he never expected what would happen next. 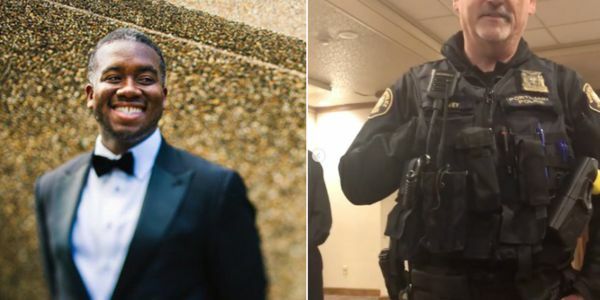 While taking the phone call with his mother in a quiet corner of the lobby, the 34-year old was approached by hotel security, harassed, and forced to leave the hotel under police threat. Massey filmed the encounter with hotel security guard, Earl Meyers, in the lobby of the hotel. According to Massey, Meyers approached him and accused him of trespassing. Even though Massey explains he's a guest of the hotel and shows his key card, the video shows Meyers calling the police. Massey was later forced by police to empty his room and leave the hotel. This is inexcusable. It's clear DoubleTree security and staff targeted Massey, a black man who had every right to be at the hotel, solely because of his race. Massey recounts that hotel security and staff called him a "safety threat to other guests" — simply for minding his own business. Sign the petition calling on DoubleTree to hold its staff — and itself — accountable for this appalling act of racial discrimination. DoubleTree owes more than a public apology — it must make serious policy changes to make sure this never happens again, starting with terminating the hotel security guard and manager for their discriminatory actions. Over the past year, we've seen a steady stream of shameful incidents where white people call the police on black and brown people simply for enjoying normal activities — whether it's sitting in a Starbucks, going to the grocery store, attending church, or riding in a car with their grandmother. Now, add something as innocent as calling your mother to the list of things that could get you unfairly detained. DoubleTree Hotel's actions and response were completely inappropriate and racially motivated — now the company must take serious steps to make amends and prevent further racial profiling. Sign and share the petition calling for immediate action!